Our customer support portal, Clarify, has a public-access knowledge base with many dozen tech notes. These describe specific features of iManage FileSite, related system administration tasks, and project management artifacts. As of October 2014, we have published over 100 blog articles regarding Technology for Law. For specifics, try these particular tags and categories: training FileSite troubleshooting iManage. Registered Clarify users can access our always-growing knowledge bases covering: iManage WorkSite, Test Scenarios for DMS, and DMS Business and Functional Scenarios. Contact Cersys to request a Clarify account. Cersys customers are given lifetime Clarify access to a project-specific knowledge base that records the design/technology delivered in their project, as well as the other knowledge bases listed above. If you have a current support contract for WorkSite, go to http://worksitesupport.autonomy.com and log in. You can request an account at the same URL: you should plan ahead, because it can take a few days for the request to be processed. You can download the most recent software updates from their portal. Have you reviewed Cersys’ troubleshooting articles? We have posted dozens of consolidated descriptions of symptoms and fixes, challenges and design improvements. Perhaps you should add us to your IT team. 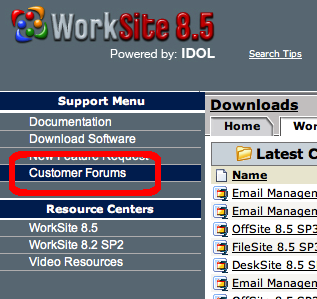 If you need to upgrade to WorkSite 8.5 or WorkSite 9.0, contact us. The project need not be expensive, lengthy, or risky. Cersys will get you up and running, and optimize your system along the way. There are many new features available in 8.5 and 9.0: you will be pleasantly pleased at the improvements. If your program folder still calls the desktop clients “Interwoven” you are really due for a product refresh! Interwoven is 3 generations out of date as a parent company. These days, the product is HP Autonomy iManage WorkSite. Once you have access, you have access to system documentation and a blog. Unfortunately, the blog doesn’t show much (any) activity between 2011 and 2015. “DOCMASTER Table – Which clustered index should I be using?” Posted by Trevor Mathias in Troubleshooting WorkSite. February 25, 2009. “The “Unable to retrieve email from Exchange or a conflict exists” error” Posted by Chris RuBert in the Troubleshooting WorkSite blog. May 13, 2011. WorkSite Build Numbering – Autonomy Protect Customer Forums. – specifically Christian Villegas’ list of build numbers.